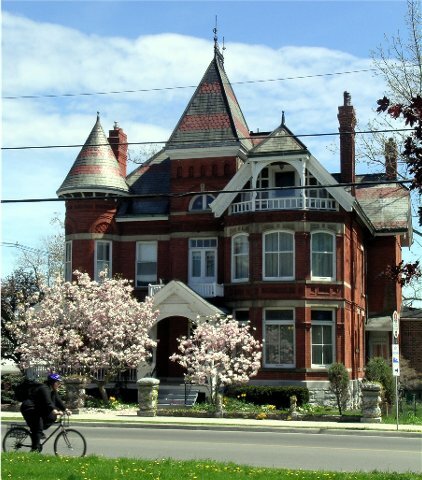 This fine brick Victorian house, built in 1886 in Kingston, Ontario Canada, is the sort of residence one imagines as the outer shell of the McLoughlin rooms. 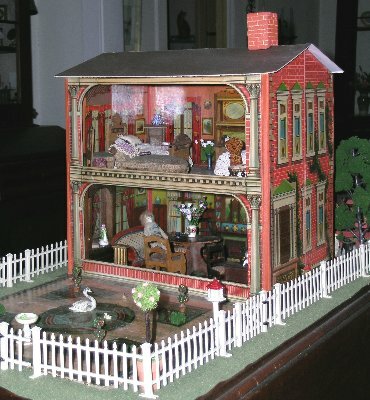 Built for a successful grocer and maintained by servants, it was considered at the time the finest house in the city. 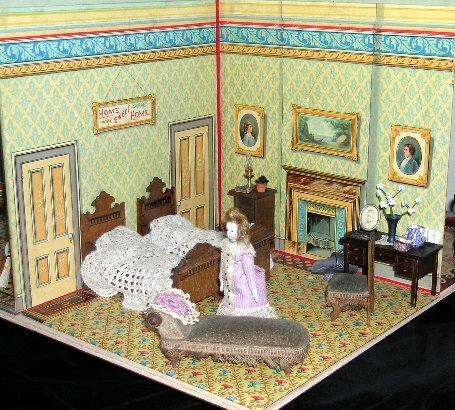 One of the exciting aspects of the McLoughlin rooms is the use of full colour, whereas contemporary photographs, such as this Boston bedroom in the 1880s (below right), are monochromatic in sepia or black and white or hand-tinted. 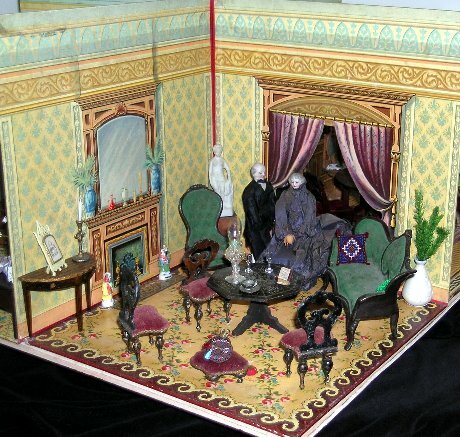 In real life, posh parlours (above) were rich with with ornaments. 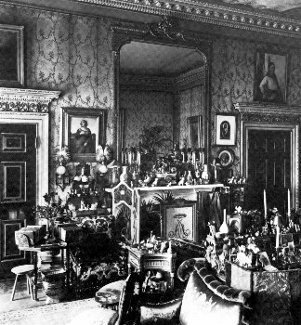 The McLoughlin rooms show the interest of the trendy in collecting Japanese porcelain during the 1890s; whereas, the sphere of servants was characterized by long hours and hard work in plainer surroundings. 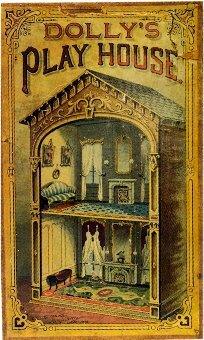 The rooms suggest how the upper class lived and the lifestyle to which the middle class aspired. 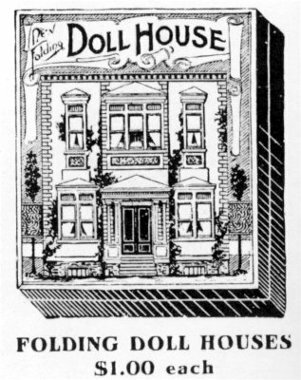 The McLoughlin Company is also well known for Dolly's Play House, a two-room house made from 1884 to 1903, and advertised in the Montgomery Ward catalogue of 1903, which included their "Pretty Village," a set of folding cardboard houses. 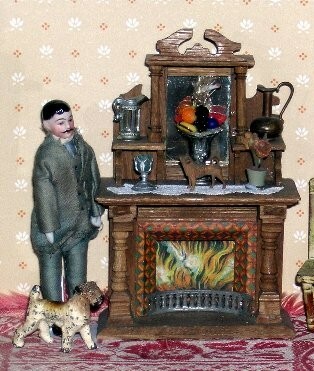 Another collectible house is the Garden House (below) from the first decade of the 20th century. 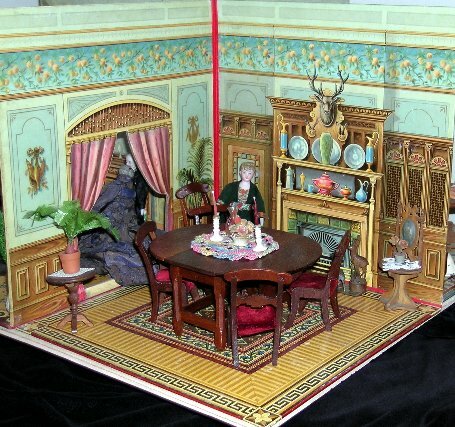 The front wall is hinged and can be let down onto a table top to reveal two interior, well decorated, rooms, as well as a formal garden. 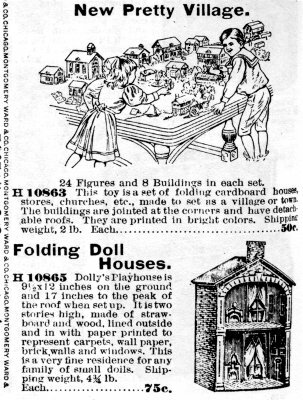 This house was later replicated by Milton Bradley (look for the name printed on the lower side). 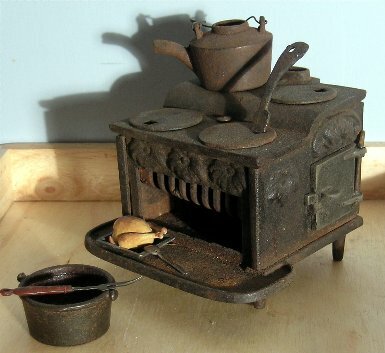 The colours of the original McLoughlin are still remarkably brilliant a century later. 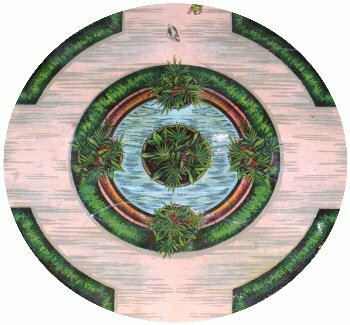 Detail (below right) ornamental pool in front garden. 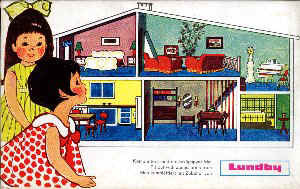 The Garden House (here with replacement roof and chimney) with the front wall let down revealing the garden. 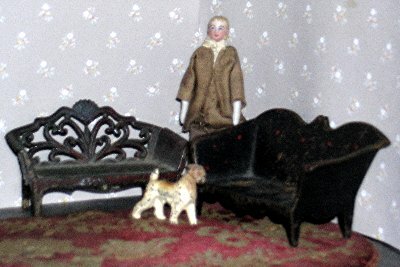 The two rooms are furnished with German furniture c1900. 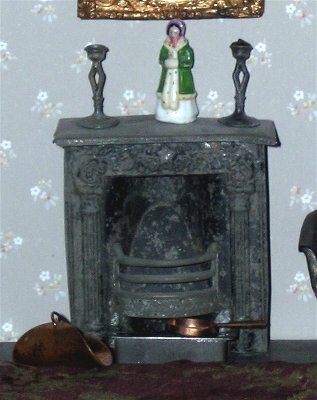 On the right, as sold for $1 by Woodward & Lothrop in Washington in 1911; the front wall is shown in the upright position..
Cast-iron was of great importance during the 19th century and suited factory production. 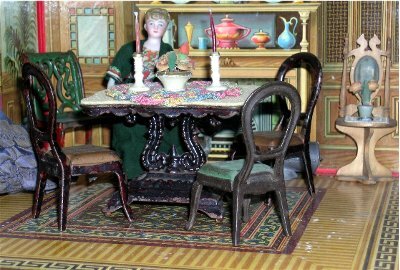 In true-scale furniture, it was mainly found in garden benches, chairs, urns and fountains, as well as interior heating and cooking stoves. 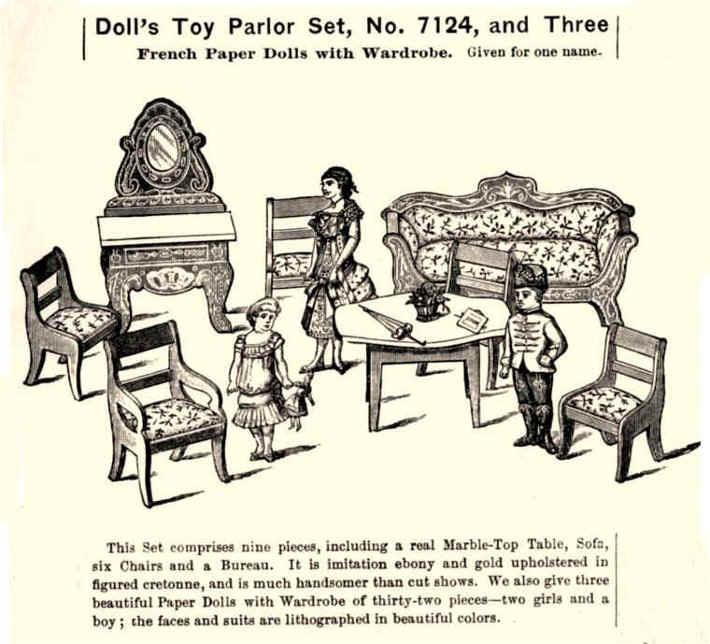 Its metallic surface hardly made for comfortable seating but, with the suspension of belief often applied to dollhouse furnishings, it was and is acceptable for parlour, dining and bedroom furniture, particularly when it was formed with the high quality of design and manufacturing produced in the J.& E. Stevens factory (founded in 1843) in Connec ticut. 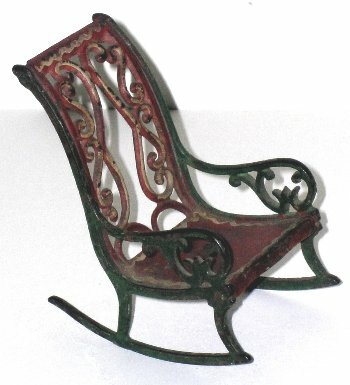 Green-painted iron becomes velvet upholstery with buttoning and moulded-iron becomes carved wood. 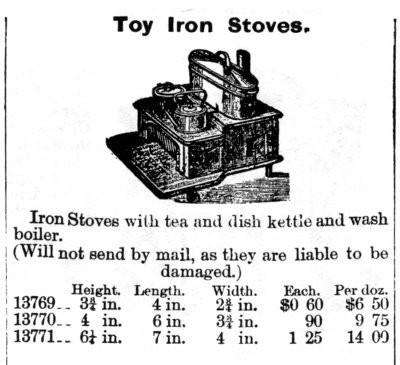 The pieces were made over a fairly long time from at least 1867 to 1891, the latter by the Toledo Brand. 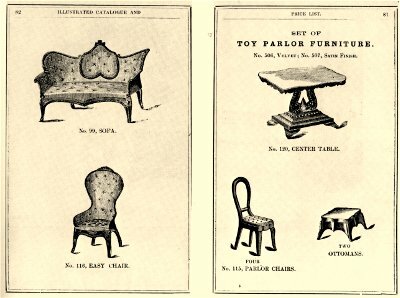 Unfortunately, the parlour set, shown in the Stevens & Brown catalogue of 1872 (below), was reproduced in the 1960s, leading to confusion by collectors, although new pieces are usually less refined and less well finished. 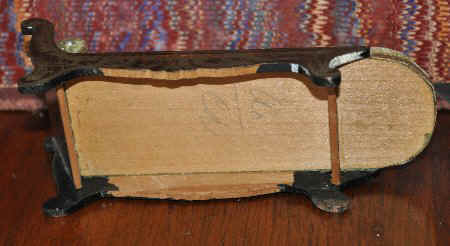 If one can track the provenance previous to the 1960s, this is helpful. 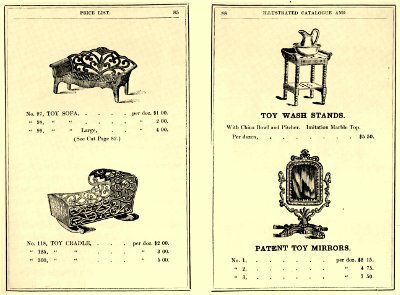 The style shown in the catalogue pages illustrated here is Rococo Revival (reviving a style dominant in Franc e in the mid 18th century) featuring S and C curves, often based on nature including vines, shells and flowers. 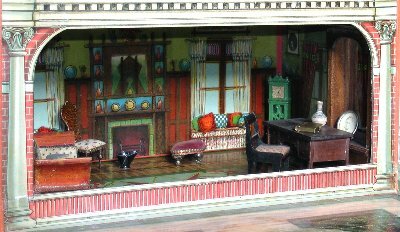 This attractive style is also found in dollhouse furniture made of wood with some featuring fret work. 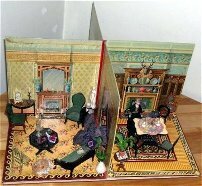 The delicate aspect of this style seems to suit its miniaturization. 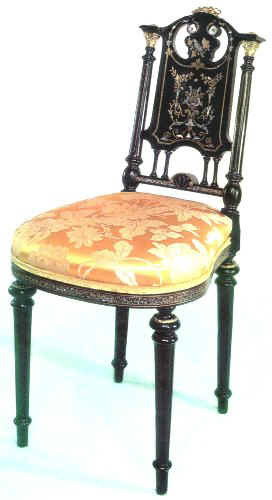 A popular side-chair in real life and in miniature was the balloon-back (the upper part of the back resembles a circle, right) often with cabriole (serpentine) front legs; here seen (further below) pulled up to the centre table with rococo curved top and classical lyre support. 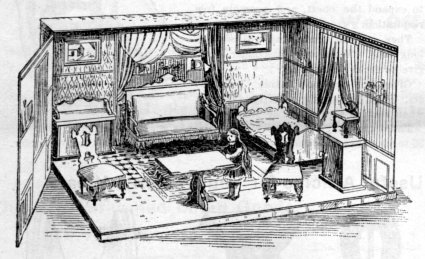 The high-back sofa forms a charming up-side-down heart. Even the plainer tables have scalloping on the aprons. The hooded cradle pushes the envelop over credibility about materials with open lacework sides and ends, only achievable in metal for furniture with such a practical function. 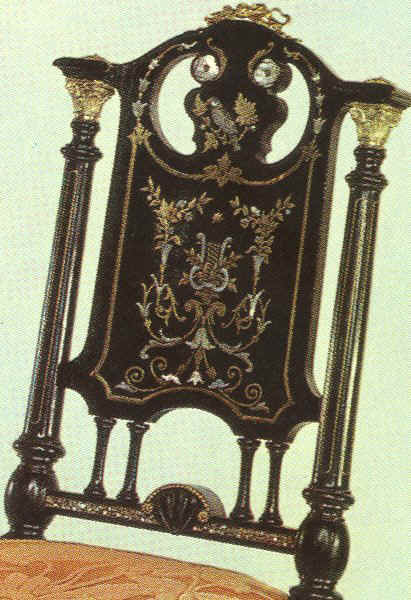 The forms are Biedermeier but the decoration is Boulle, named after French ébéniste A.C. Boulle (1642-1732) whose work was carried on by later cabinetmakers; his fine decorative schemes of brass, tortoiseshell & other materials contrasted well with a background of dark woods, applied as veneers over secondary wood, and sometimes referred to as marquetry (inlay is contrasting ornament set into solid wood). 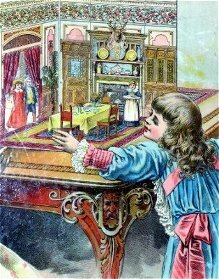 In England, nineteenth-century cabinetmakers continued the tradition under the name "Buhl". 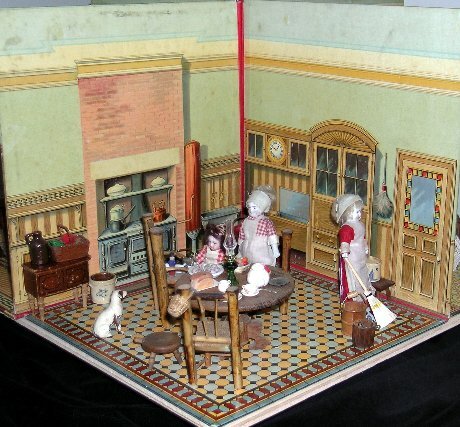 The effect is gained in miniatures by transfers, printed paper and painting. 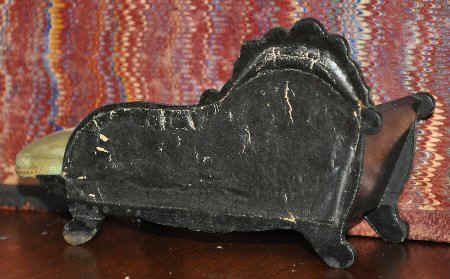 And the tacks over fabric edging on upholstered furniture gained by embossed paper. 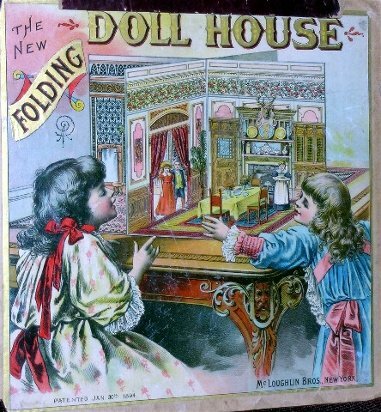 Fabric coverings usually are actual fabrics. 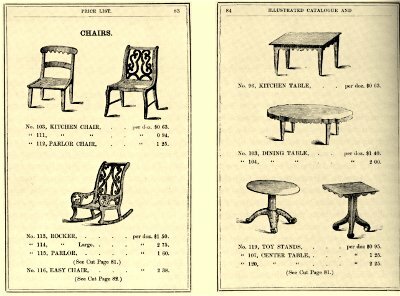 Any perceived loss by the use of imitation materials is more than made up for by the high quality of overall design and construction. They are well made. 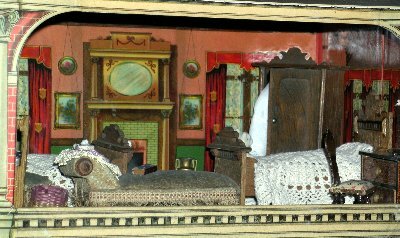 right: bed footboard in gilt "inlay" on "rosewood"
below: a parlour set in "imitation ebony and gold" from Youth's Companion, 1886-89. 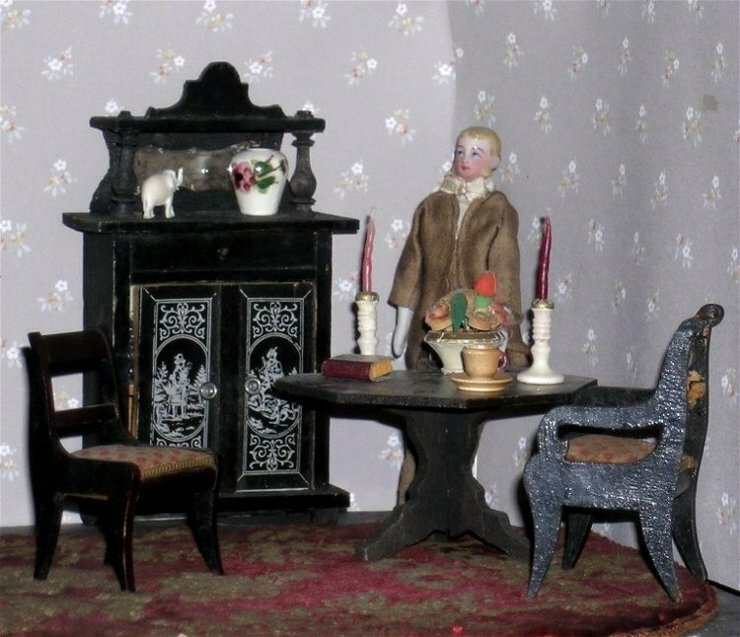 A dominant style in real-life architecture and to a lesser degree in furnishing in the late 19th century was Gothic Revival but it is less prevalent in dollhouse furnishings than other styles -- eclipsed by the love of Rococo Revival and to a lesser degree classicism (see Biedermeier). Its most identifiable characteristic is the pointed arch, derived from the great cathedrals of medieval Europe. 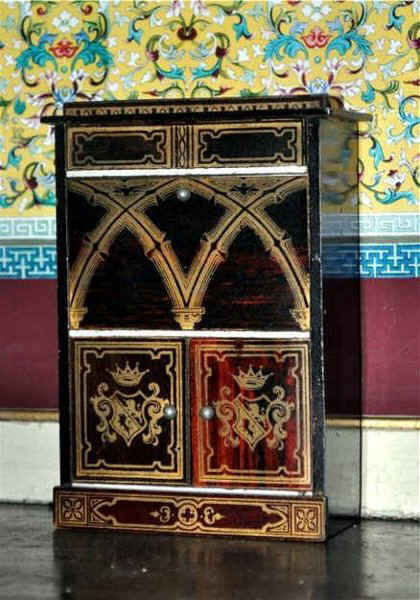 Here the style is illustrated by a Boulle desk with bold, interlaced arches on the flap, which can be lowered for a writing surface. 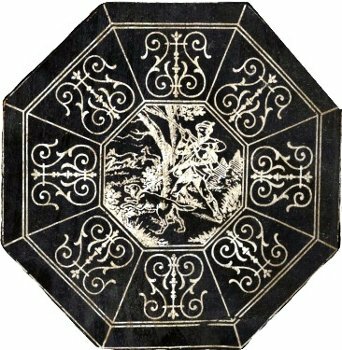 The coat-of-arms on the lower doors reminds one of decorations in manor houses. 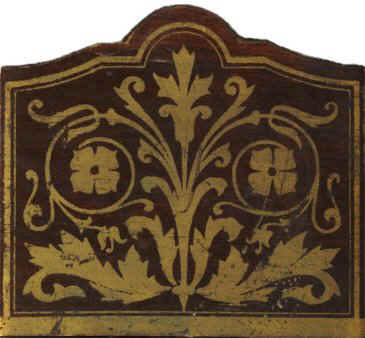 The base has quatrefoil decorations derived from medieval church decorations, as seen in this band of panelling c1420. 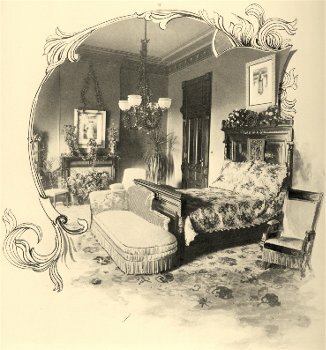 left: lithographed room, 14.5 x 10 inches, and set of imitation walnut furniture with blue upholstery offered for sale for $1 in the Youth's Companion of 1890. 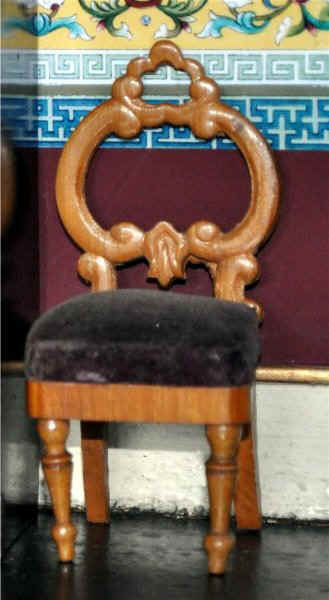 Note the plump seats with fringes and wide, boldly turned chair legs, typical of the period. 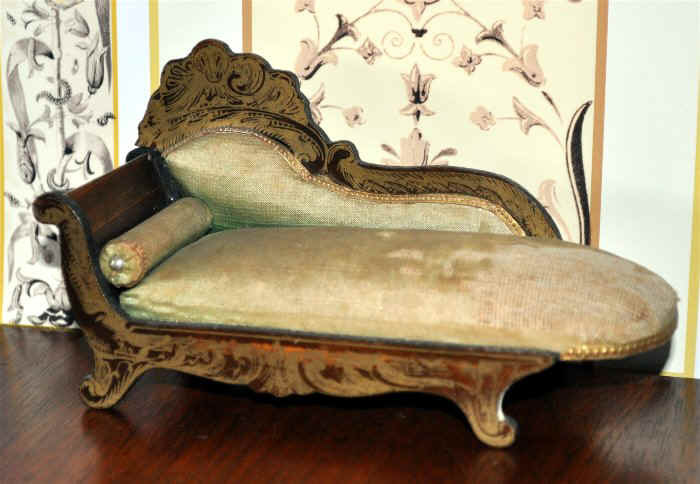 Curved ornamental upper backs on the couch and sideboard are also typical. The table pedestal is made from two thin cut-out boards fitted at right angles. 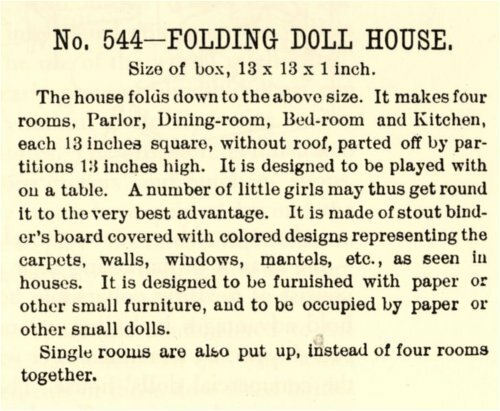 The china doll with long "real hair" was included. 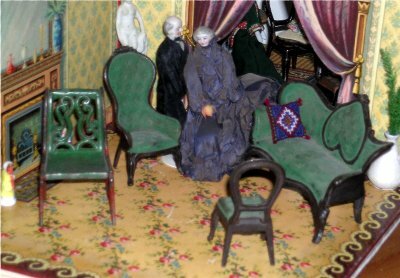 Although the origin of this room and furnishings is not given, Germany is a reasonable guess.